“So, we bought a list of sales contacts and now we need to do something with it.” That’s more-or-less a direct quote from a meeting I had with Paul Santarelli, VP of Sales at PitchBook back in August 2015. Purchasing lists of contacts wasn’t part of PitchBook’s typical lead generation strategy—we relied on our newsletter and blog content to drive a lot of our inbound marketing. But a new endeavor to target business development professionals and a hasty decision all led to this moment. And as the senior copywriter at a growing SaaS startup, my job involved a lot of creative problem-solving. So, when Paul asked me to develop a strategy to get this list of senior-level sales professionals into our marketing funnel, I was up for the challenge. Content: Good content strategy is often found at the intersection of audience needs and business goals. In order to understand this audience’s needs, I turned to our own sales team. By understanding how they used our product, the PitchBook Platform, to find prospective customers, I was able to zero in on a topic: how startup company financings can signal needs for many different types of products, and therefore present a sales opportunity. Promotion: We used a combination of tools and channels to promote the webinar, including email, paid advertising, and social media. We wrote placed advertorials in our own newsletter and in our blog. We also promoted the webinar on Facebook, Twitter and LinkedIn. The list of business development contacts played a big role in our targeting mechanisms, but it soon doubled with additional contacts added through our promotion strategy. 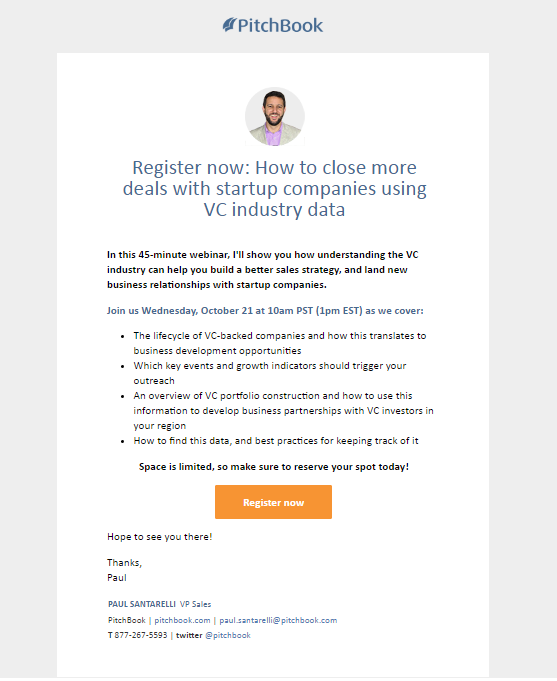 Follow up: After the webinar, we sent follow up emails with a recording of the webinar, and an excel list of the Top 50 startups receiving funding in the last three months. Based on engagement with those emails, we either sent the contacts directly to a member of our sales team, or tagged them for further nurturing.